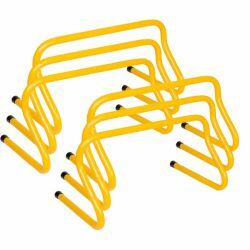 The heavy-duty 9" Champion Sports Weighted Training Hurdle Set is tip resistant and offers optimum stability. This set of six weighted plastic hurdles are designedl for speed and jumping drills, and simply adjust the space between each hurdle for stride length drills. A convenient nylon carry bag is included for easy transport. Leap over the competition when you train with our Weighted Hurdles!